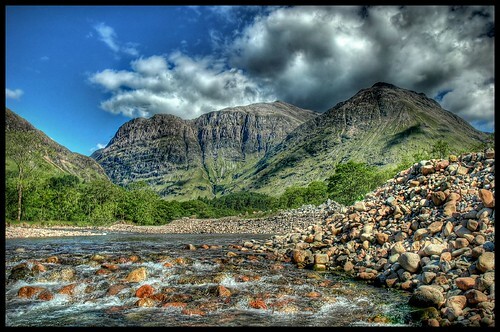 Aonach Dubh in HDR, originally uploaded by Mark Turnbull. Click on pic, see it in Flickr. The detail enhancement at a distance really makes this one pop. HDR and tonemapping gives it almost a 3-D character. As with most of these, it is BEST VIEWED IN LARGE ON BLACK. The photographer, Mark Turnbull, has also prepared a black and white version. I find my eye drawn to different things in it. In the color version my eye goes right to the back mountain; but in the black and white shot, the mountain competes for my attention with the foreground rocks on the right. Interesting how that works. The old bulls. Originally uploaded by ajschroetlin. Click on pic, see it in Flickr. Great pic in a great place...Rocky Mountain National Park. 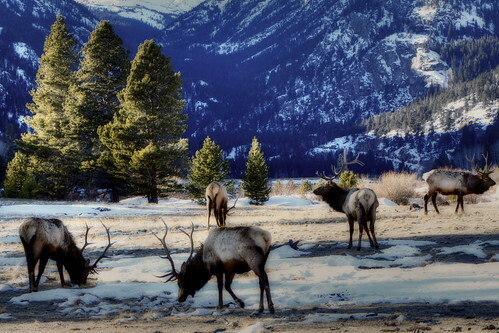 Of course the elk make the shot, but love that light too. You HAVE TO SEE THIS IN LARGE ON BLACK. Positano, originally uploaded by Mor (bcnbits). Click on pic, see it in Flickr. Wow. I could go for being here. But, to really see how great this photo is, you HAVE TO SEE IT LARGE ON BLACK....then pick yourself out window or terrace. I've already got my little blue beach hut right on the beach. 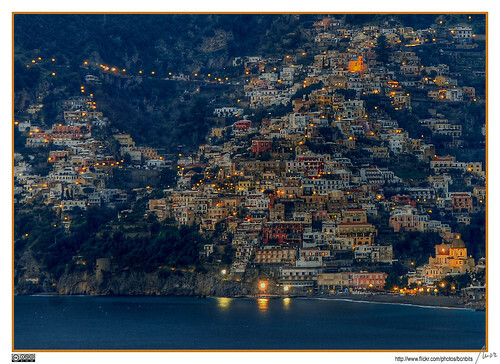 Positano, Italy...I've got it marked down. You know I love the twilight, and for some reason, I just seem to gain energy from scenes like this one. Reflected Visions Of The Past, originally uploaded by thepres6. Click on pic, see it in Flickr. Here's one that just made me scratch my head a bit. IT HELPS TO SEE IT IN LARGE ON BLACK. Makes you think about light and optics. "This is not photoshopped, or layers of different scenes and does not have any other effects applied. It is a dirty window reflection looking into an old building at sunrise. You can also see the sunrise sunlight coming through the 5 front windows in the building." The Ancient and the Modern, originally uploaded by graspnext. After yesterday's rather remarkable pic, I thought I'd use "pyramid" as a search word and see what came up. I present two today. 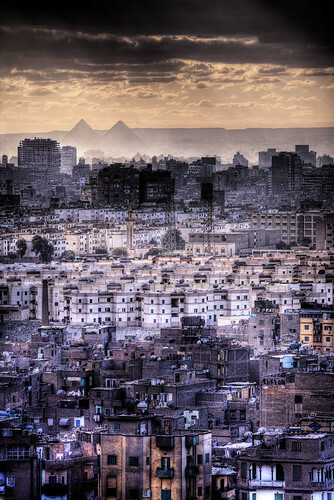 The one above I find has remarkable composition and theme with the modern high-density Cairo in the foreground set against the ancient pyramids in the background. Not only does it say a lot about the endurance of the pyramids, but it's just cool to think about all the history and span of time in between. Kinda raises the question...This is progress? MUST SEE IT IN LARGE ON BLACK. And below is the glass pyramid entrance to the Louvre. Pretty stunning technical HDR work. IT, TOO, NEEDS TO BE SEEN IN LARGE ON BLACK to see remarkable detail in the stonework on the building among other things. pyramide de nuit. Originally uploaded by coolmonfrere. Click on pic, see it in Flickr. Pyramid in Black and White, originally uploaded by Foto Blitz Color. Click on pic, see it in Flickr. 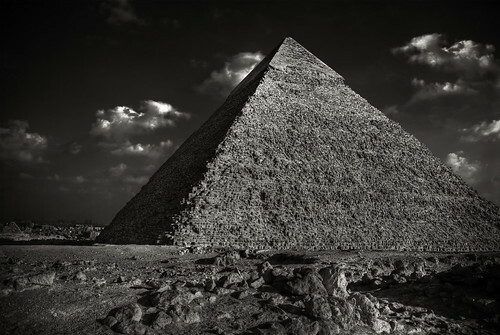 Not too many man-made things really deserve true awe, but the pyramids probably qualify. I hope I get to see them for real some time. Very cool choice to put this in black and white...much drama is added. GOTTA SEE IT IN LARGE ON BLACK. And not that it deducts anything from this amazing shot, but the sky is photoshopped, and there's a definite giveaway to that if you look hard. And Damn...that "go to" list is getting longer and longer as a result of writing this blog....Iceland, Venice, the Canadian Rockies, and even the end of the earth. Oh well, at least I can see them all in HDR. Karluv most macro, originally uploaded by mexikanec. Click on pic, see it in Flickr. This pic above is pretty neat, but you GOTTA SEE IT IN LARGE ON BLACK to get the most out of the effect. 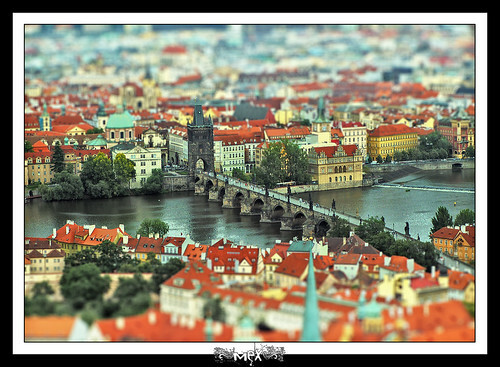 It is an HDR shot, but it is also "tilt-shift" processed to artificially narrow the focal length in order to trick your eye into thinking it's a tiny model of a city bridge. This is a real city though...and here's the "normal" HDR pic without Tilt Shift processing. Ironically, I used the search word "macro" to see if I could get a good closeup on a miniature subject. In a sense I sort of got that, but not in the way I was expecting. I've found and posted other tilt-shift shots before...here's my fav from way back in March. Peace of mind, originally uploaded by h.andras_xms. Click on pic, see it in Flickr. Needed a change of pace and thought this was interesting. I very much like the composition, and I think it shows how HDR processing can add something to this genre of art photos. GOTTA SEE IT LARGE ON WHITE. Schwabacher Morning - Thanks Jeff Clow!, originally uploaded by James Neeley. Have you ever seen that Joy of Painting show on PBS where Bob Ross takes a painting from blank canvas to finished product in 30 min? This pic is clearly reminiscent of the quintessential Bob Ross painting...but in photographic form. Gotta see the finished product IN LARGE ON BLACK. If you haven't see the show, I recommend it for when you are feverishly ill in bed...because there's just something about it that puts you right to sleep before he finishes the painting, without fail. Here's an example...in just 12 easy steps, except I am zonked out by step 5. TONNERRE : FOSSE DIONNE IMG_0617_8_9Enhancer. Originally uploaded by dirk vde. Click on pic, see it in Flickr. An historical artesian water source in France that became a town center. While it looks a bit still in the tank, the free flowing water can be seen emerging from the lower left. The Flickr caption says it is actually somewhat bluish in color when it emerges from the spring, so I think the colors are pretty authentic. VERY TRANQUIL IN LARGE ON BLACK. Cadair Idris 4, originally uploaded by Geoff Edwards. Click on pic, see it in Flickr. And I have to say, even after all the HDR images I have seen, the sheep one below, WHEN VIEWED IN LARGE ON BLACK, still blows me away. 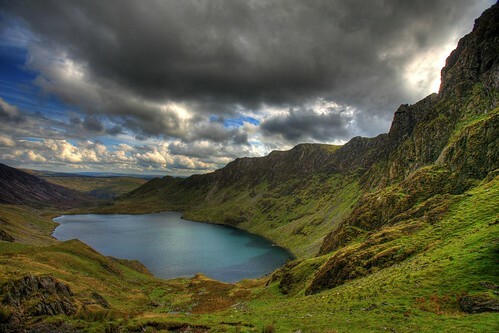 Cadair Idris 13. Originally uploaded by Geoff Edwards. CLick on Pic, see it in Flickr. The Queen and her commoners HDR. Originally uploaded by David Giral. Click on pic, see it in Flickr. Sorry Gang for the lack of posts. Away for the weekend. But have returned with a couple today to make up for it. Turned on Rhapsody and was inspired by Aimee Mann's "How am I Different" for today's search word. This led to two totally different pics. SEE THE ABOVE ONE IN LARGE ON BLACK. And the pic below has amazing illusory reflections (MUCH BETTER IN LARGE ON BLACK). That has caused me to think much about reflections and if they are always this illusory or not. To some degree I suppose they have to be. It's a Zen principle that to speak of a thing is to miss the mark. But isn't to reflect on a thing the same? I suppose the only time you don't miss the mark is to experience a thing in the moment. 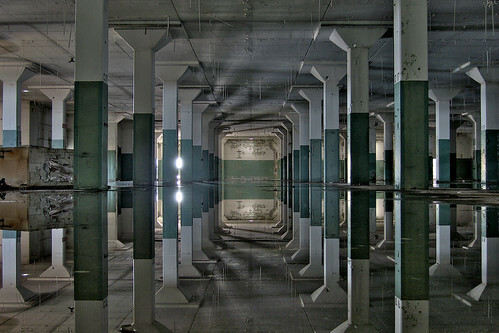 Hall of mirrors II. Originally uploaded by rustyjaw. Click on pic, see it in Flickr. Teton Fire, originally uploaded by James Neeley. Click on pic, see it in Flickr. I was trying to cool off from this intense heat with a snowy picture search and found this jawdropper. What amazing colors!! From the photographer's note on Flickr, it's all very real taken at sunrise with just HDR tonemapping, which means it essentially really looked like this. As James Neely the Photographer said in the Flickr comments..."I didn't do much of anything else since the image was so naturally intense." Yes...and very cool Mr. Neely, especially so on a hot summer day. And even COOLER IN LARGE ON BLACK. 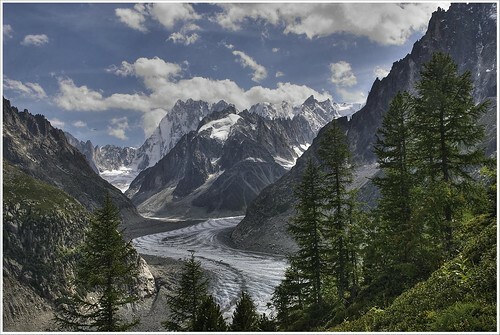 Mer de glace, Mt. Blanc Range, originally uploaded by VeloManiac. A cool glacial scene like this helps on such a hot day. GOTTA SEE IT IN LARGE ON BLACK. Incredible depth, incredible detail...in the large version, seeing the boulders on the mountainside shade near the center where the glacier bends would not be possible w/o HDR. 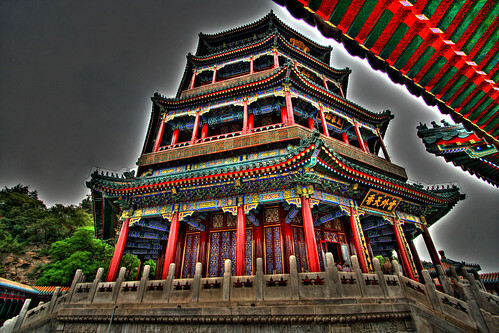 万寿山 - Tower of Buddhist Incense, originally uploaded by stoicviking. CLick on pic, see it in Flickr. I have not done a Chiller in a while, but it seems fate brought me this photo so I had to post it. My reasoning?...it was 104F here today, and the only hotter day that I have ever experienced was when I visited the summer palace pictured here. That day in June 2005 in Beijing was 108F with incredible throat-peeling, bird-strangling smog. However, I can assure you even with the thickest of Beijing smogs, the sky did not quite look like this (well, maybe it was closer than I initally thought). I have a personal distate for this heavy a hand on the HDR...need to increase the light-smoothing to neutral and back off the strength setting. Hey, but maybe that's just me. Washington Monument, Twilight, originally uploaded by Foto Blitz Color. Click on pic, see it in Flickr. Often these perspective shots come out a bit disappointing, but this one is pretty darn good. 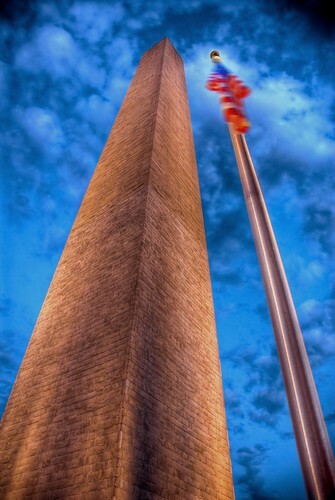 The HDR processing lends excitement and realism by bringing out the stonework detail, the contrast in the sky, the color saturation, and even the blurred flag. GOTTA SEE IT IN LARGE ON BLACK. A Walk in the Light Green, originally uploaded by damian 78. Click on pic, see it in Flickr. 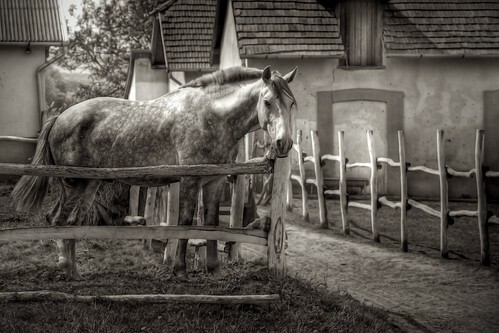 A very striking photo that is obviously processed beyond just HDR (and very effectively!). I wasn't sure what it was all about, until I saw it IN LARGE ON BLACK. 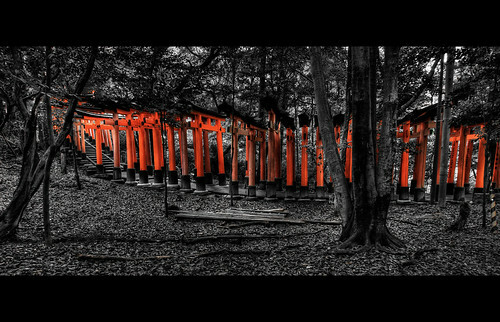 Evidently the red gates line the entire 4Km of this trail near Kyoto, Japan. That's pretty neat. 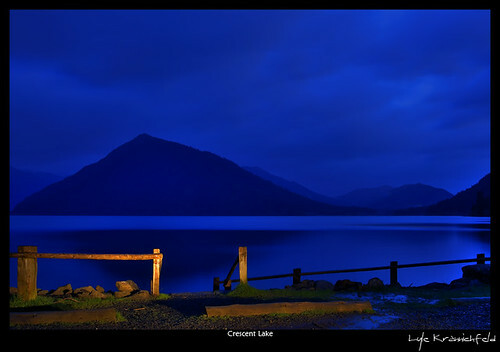 Crescent Lake, originally uploaded by Lyle Krannichfeld. Click on pic, see it in Flickr. A relaxed fitting picture for the search word, "subtle"...partly selected though because I have been to this lake and it is a cool place. HERE IT IS IN LARGE ON BLACK. 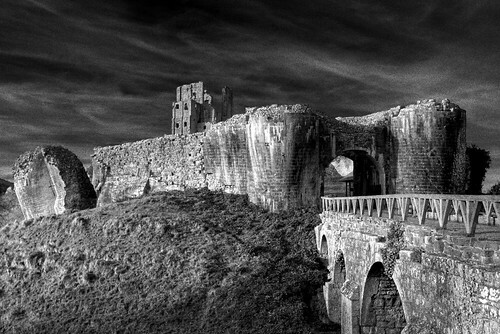 Corfe Castle, Dorset, originally uploaded by Mr Jam. Click on pic, see it in Flickr. So much to say, so little space. A very eerie shot that will now be in my dreams. First...YOU GOTTA SEE IT IN LARGE ON BLACK. Kudos to Mr. Jam, the photographer. I was compelled to look up some history on this castle and found it to be almost as interesting as the shot. King Edward II of England was assasinated on his horse (stabbed in the back) near this spot in 978 (from Wikipedia: "the body of the murdered king slipped from the saddle of his horse and was dragged with one foot in the stirrup until it fell into a stream at the base of the hill upon which Corfe Castle stands." The Castle was evidently constructed in the 11th Century after the King was made a saint. If you want to know more you can check it out here. So many pieces come together in this shot...the lighting on the foreground hill, the wispy sky, and the cross-embossed left edge of the castle falling away...so mesmerizing. Hong Kong from The Peak on a Summer Night, originally uploaded by Stuck in Customs. Click on pic, see it in Flickr. 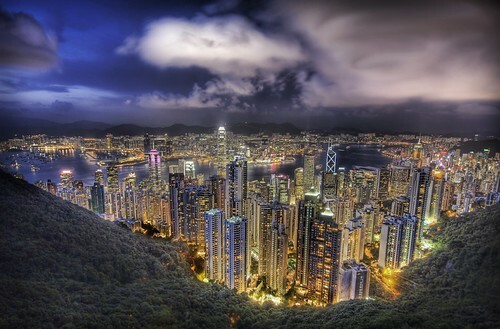 Wow...nice cityscape and definitely a unique perspective on Hong Kong. I had no idea that the city was up against such abrupt wooded hillsides like this. The way the hillsides flow down into the city it does have that jungle-humid look. GOTTA SEE IT IN LARGE ON BLACK. Morning Moulton, originally uploaded by James Neeley. Click on pic, see it in Flickr. Great HDR shot here, but maybe even better composition. This barn can be shot many ways, but in the shot above the mountain's peak really mirrors the barn's. GOTTA SEE IT IN LARGE ON BLACK for the full effect. Colors of Buddha, originally uploaded by Stuck in Customs. Click on pic, see it in Flickr. Well, I was thinking that yesterday's shot was gonna be hard to top, so why not just at least go for some color today. 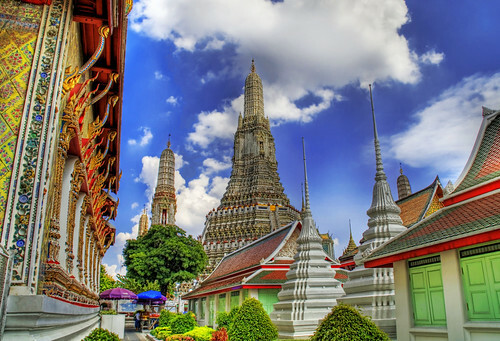 Selected this rather cool shot of a buddhist monastery in Thailand. GOTTA SEE IT LARGE ON BLACK. The search word was pretty broad today as 8,660 photos showed up. I hate it when that happens, 'cauz I can't look through them all, but I think I found a pretty good one. Yeah, it's okay...I nearly fell out of my chair too. Scroll around a bit. Look at the detail in the foreground...and the background. Yikes! Burn On Big River, originally uploaded by griffsflickr. Click on pic, see it in Flickr. And a time to every purpose under Heaven..."
Hello blogosphere. I am making a humble return from a cathartic memorial service for my sister, Karen. We played Turn!, Turn!, Turn! as the recessional song. It'll be sticking in my head a while and I don't mind. I somehow feel freer to speak of her now that she has stepped out of this world into the next. She passed from liver cancer. She was a wonderful person and a dedicated physician, and many of her patients paid their respects at the service. After great difficulties in this life, I do feel she is at peace. This shot is lovely, and it just happened to be from coastal Connecticut near where Karen spent her childhood and learned to love the water. What a sky!! But that's not all there is to this shot, because it also has a real sense of neighborhood to it. Clouds over Tahoe HDR #2. Originally uploaded by Bill Strong. Click on pic see it in Flickr.